What is the default keystroke for cycling through windows in an application, e.g., evince? How can I change this default? Currently, Alt-tab cycles through all windows, but I only want to cycle through windows of the same application. Edit: This is not the correct answer for the above question. When i wrote this i was thinking about tabs of an application and not windows. So, this answer works for cycling through tabs of an app. Ctrl + PgUp/PgDn is the default keyboard shortcut to cycle through windows/tabs in an application. You can also refer to the answer to this question here, which is similar to yours. Is it possible to cycle ONLY between windows of the same application when other windows are open in the same workspace? I cannot confirm the other answer that was also marked as definitive. Because it doesn't work, other questions (here and here) asking for an answer are marked or can be marked as duplicate of the present question. At the same time the present question can be marked as duplicate of this one: What are the different methods to switch between windows and workspaces?, which specifically mentions at its first point: windows of the same application on the same workspace. But that point is not mentioned by Daniel Foré's authoritative answer, which makes me think that in fact the answer to the question "how it is possible to cycle exclusevely between windows of the same application" is that "it's not possible". The absence of this option is probably due to the presence of others - as indicated in Daniel Foré's answer - which achieve the same goal. The way the Pantheon desktop uses workspaces is very intelligent. There is no new empty workspace, and any fullscreen window (Super-F) gets its own workspace. 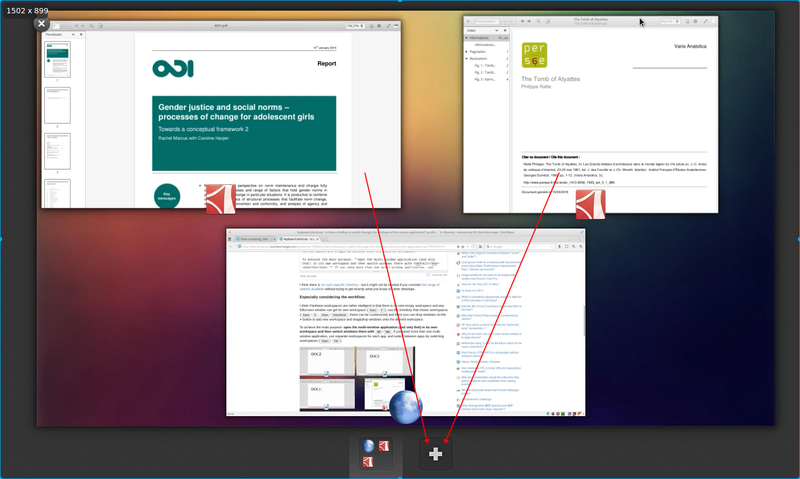 To achieve the goal: open the multi-window application (and only that) in its own workspace and then switch windows there with Alt-Tab. If you need more than one multi-window application, use separate workspaces for each app, and switch between apps by switching workspaces (Super--Tab). To create new workspaces for windows as said before, just make fullscreen window (Super-F) or use the shortkey that shows workspaces (Super-S, Super,DownArrow) - those can be customized) and drop the windows of your application onto the + button to add new workspace. Not the answer you're looking for? Browse other questions tagged applications keyboard-shortcuts window-management or ask your own question.